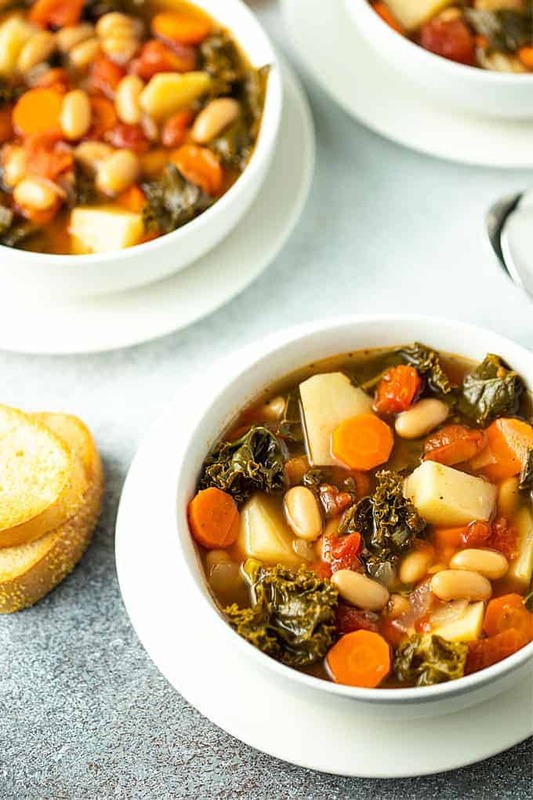 You’ll never miss the meat in this hearty, comforting and satisfying Kale Soup. 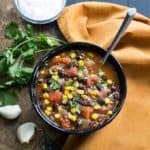 What I love about this soup is that it’s healthy (without sacrificing flavor) and totally satisfying. A bonus is that it’s also vegan and gluten-free! I was so surprised when I took my first bite of this soup years ago. I literally didn’t miss any meat at all in this soup. 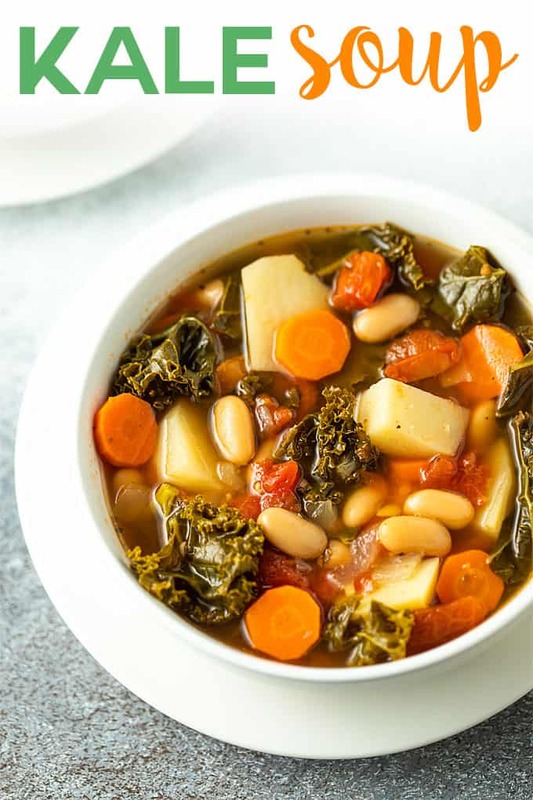 All of that kale swimming around in a seasoned vegetable broth with potatoes, carrots, onions and beans… so good! If you don’t care about this being a vegetarian soup, chicken broth would work as well as vegetable broth. I recently made a pot of this soup and decided to update the photographs (originally posted in February 2016). This recipe comes together in about 50 minutes and makes a huge pot. I used my 6-quart dutch oven and it almost filled it to the top… so there’s going to be plenty to go around AND leftovers. 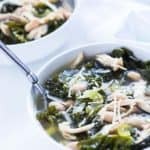 One bunch of kale looks like a lot when you chop it up to go in the soup, but by the time it wilts down after cooking for a few minutes you’ll have plenty of room for all of the other ingredients. What is your favorite way to eat kale? 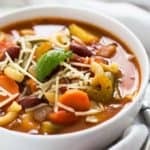 I hope you enjoy this soup as much as I have over the years! Originally published February 8, 2016 and updated with new photographs January 2, 2019. 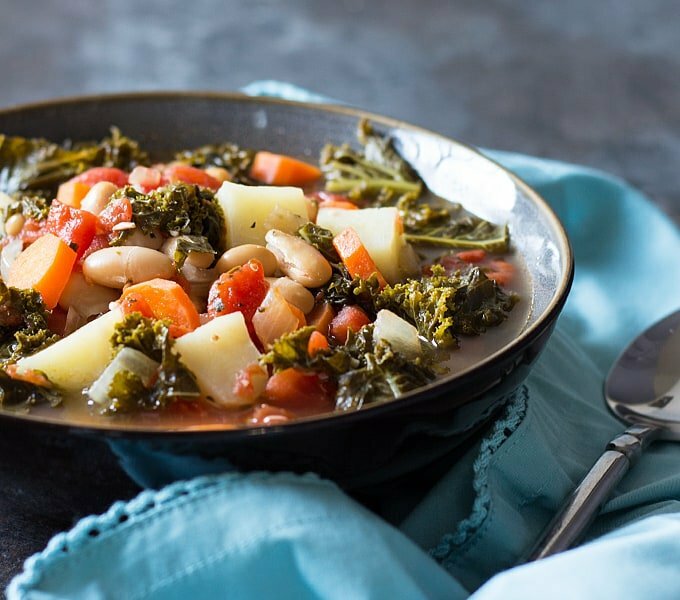 You’ll never miss the meat in this hearty and comforting soup full of kale, beans and vegetables! 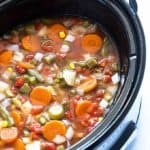 Heat olive oil over medium high heat in a 6-quart dutch oven or soup pot. Add onions and garlic and cook for 2 minutes, or until onions are soft, stirring constantly. Add kale and cook for an additional 2 minutes, stirring constantly. Add vegetable broth, diced tomatoes, cannellini beans, carrots, potatoes and Italian seasoning. Bring to a gentle boil and reduce heat to maintain a gentle simmer. Cover and cook for 25-30 minutes, or until potatoes and carrots are tender. Season with desired amounts of salt and pepper. 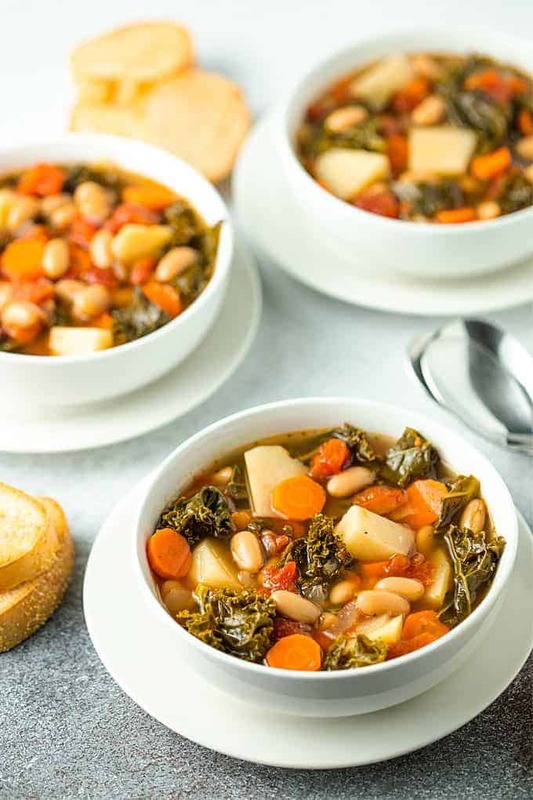 This looks so hearty and wonderful – exactly how I’d like to recover from too much indulgence over the weekend! TOTAL awesome, i would also add pepper flakes for a little kick. I just bought two bunches of Kale from Earth Fare and this will be our dinner for tonight. Oh My Gosh, this soup was “Outstanding”! Thank You, you just made My night. You were right, not missing the meat. 5 plus Stars! Made this soup for dinner tonight and used up some of the bountiful kale coming in from the garden. 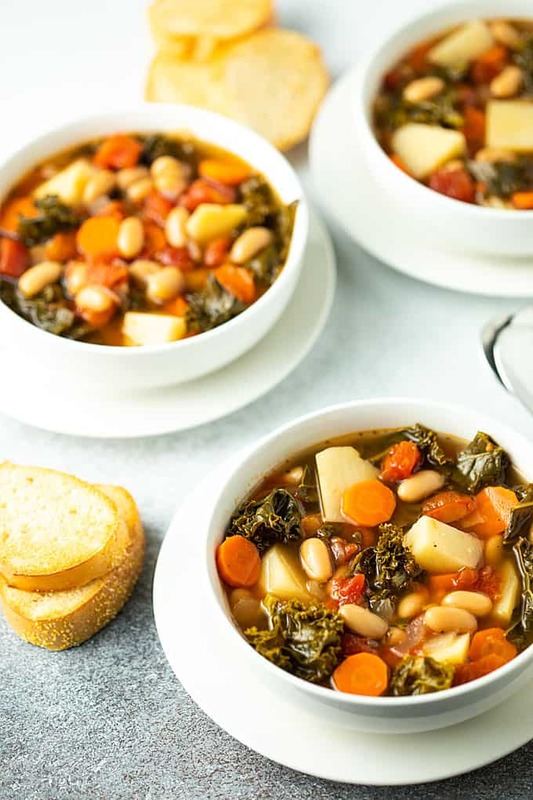 It will definitely be in the fall/winter rotation as it is wonderfully hearty and flavorful. The only change I made to the recipe is that I didn’t peel the potatoes (mostly because I’m lazy) and I added a couple dollops of plain greek yogurt to my bowl. Initially, this was just to cool the soup down as it was piping hot coming right off the stove and we didn’t want to wait to eat. It turns out, I love the yogurt addition. Thanks for the recipe! 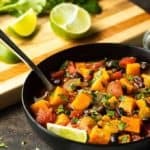 Love this soup, made it with sweet potatoes instead of russet absolutely outstanding. Has become a staple in our house. 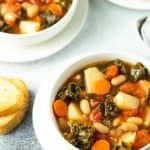 This soup was a snap to make and a perfect use for the hodgepodge of veggies I had in my fridge – especially the half jumbo bag of fresh kale that I had bought at the market a week ago and needed to use before it wilted! I didn’t have any canned diced tomatoes on hand, but I sliced a bunch of grape tomatoes and those tasted quite nice in the finished product. Instead of canned or boxed broth, I used veggie bullion cubes and extra water to compensate for the liquid from the canned tomatoes. 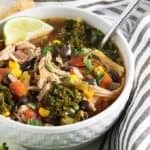 Very flexible recipe and the soup came out great, looking forward to a week of healthy easy lunches and dinners from the leftovers!.